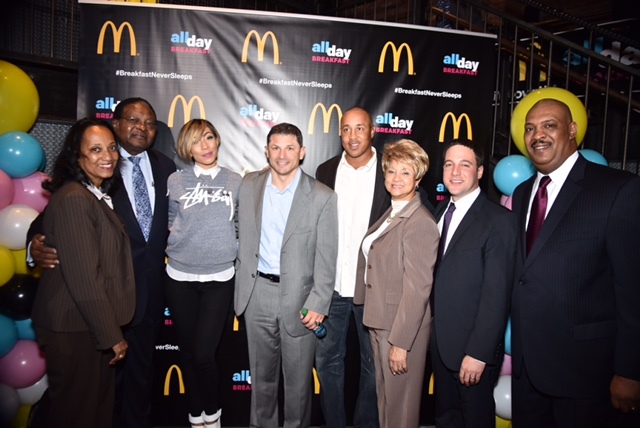 Left to right: Franchisees Cort and Allen Norman, R&B singer Bridget Kelly, former NY Jets player Wayne Chrebet, former NY Knicks player John Starks, franchisee Nellie Thomas, franchisee Josh Kaufman, franchisee Brian Hairston. To answer the demand of customers who live, work and play in and near the city that never sleeps, McDonald’s throughout the New York Tri-State area are now serving breakfast all day. To celebrate, local McDonald’s restaurants hosted activities with a marching band kicking off the launch event and inviting customers to enjoy McDonald’s All Day Breakfast menu and share their experiences with #BreakfastNeverSleeps starting Oct. 6th. Starting Oct. 6th, customers can visit McDonald’s after 11:00 a.m. and enjoy McMuffin Sandwiches (Egg McMuffin, Sausage McMuffin with Egg, Sausage McMuffin), Hotcakes with Sausage, Sausage Burrito, Fruit ‘N Yogurt Parfait, Fruit & Maple Oatmeal and Hash Browns, along with McDonald’s World Famous Fries and other iconic favorites, like the Big Mac and Filet-O-Fish. 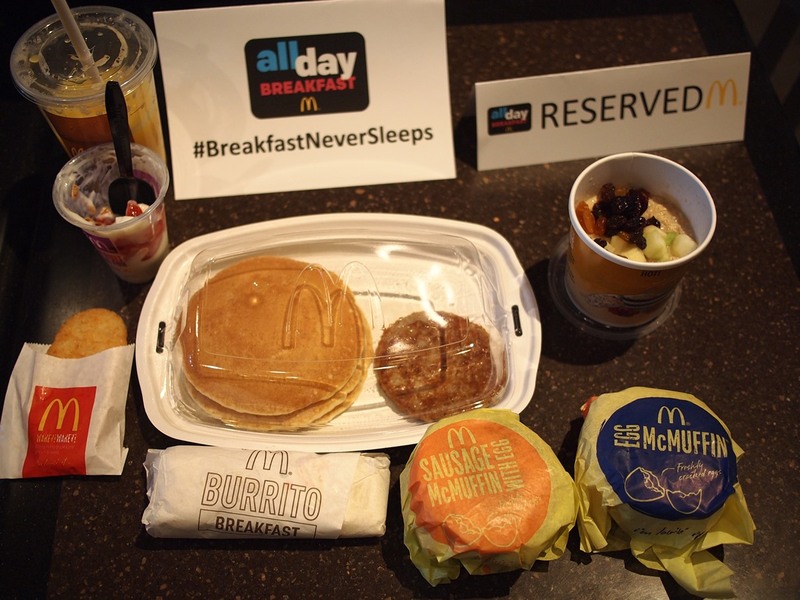 Customers can enjoy their Egg McMuffin and celebrate the launch of All Day Breakfast with several events taking place throughout the New York Tri-State area. • Tuesday, Oct. 6, 6 a.m.-10 a.m., McDonald’s 220 W. 42 St. –KTU 103.5FM “Cubby and Carolina In The Morning” broadcasting live from the McDonald’s restaurant with giveaways and games. • Tuesday, Oct. 6, 11:01 a.m., McDonald’s 220 W. 42 St. – All Day Breakfast Opening Day event with guest appearances from former New York Jets Wayne Chrebet, former Knicks, John Starks; singer and songwriter, Bridget Kelly; the Brooklyn Nets Cheerleaders; the Brooklyn United Marching Band; and the McDonald’s Gospel Super Choir. • Wednesday, Oct. 7, 6 a.m.-7 p.m., McDonald’s 220 W. 42 St. – Hot 97 street team and on air mixers DJ Enuff and DJ Big Ben will be live on-site and live on radio mixing during their 97 minutes of commercial free music providing entertainment the entire time with giveaways and games. • Wednesday, Oct. 7, 12-2 p.m., McDonald’s 2397 Adam Clayton Powell Blvd. – The McDonald’s All Day Breakfast Jingle Contest with Radio 103.9 will award cash prizes and giveaways to the best jingle submitted by local poets, rappers and singers. • Thursday, Oct. 8, 12-2 p.m., McDonald’s 4040 Broadway at 170 St. – LaMega 97.9 street team and on air mixer, DJ Kassanova, will be mixing live on site providing entertainment, giveaways and games. In addition, a McDonald’s All Day Breakfast wrapped hybrid car convoy will be traveling throughout the New York Tri-State area from Oct. 6-10 with street teams handing out McDonald’s premiums and coupons. Customers can find out more information about McDonald’s All Day Breakfast menu and the events and activities that are starting today at www.mcdonaldsnytristate.com.